Get Me To The Church and Beach On Time! But destination weddings take considerable planning, and the best accommodations are not always available to last minute shoppers. The earlier you begin to plan your wedding, and the more experienced and professional assistance you have, the greater your chances of pulling off a hassle-free, exotic wedding. Use this guide as an introduction to destination weddings that you can take to your travel agent to begin planning your own personal idea of perfection. A professional travel consultant skilled in the details of destination weddings is invaluable. Using your travel consultant as a contact point provides you with a "one-stop shopping" opportunity. A travel consultant can ensure that you are presented with a range of destinations and options, as well as assemble a travel package for the wedding party that is the best possible value. An experienced travel consultant can also provide you with wedding planners local to your chosen destination to handle the logistics of the ceremony and reception, however minimalist or involved. The most important decision in planning a destination wedding is the location. Some couples choose a destination that they have already visited , while other couples choose somewhere new hoping to create brand new memories they will always relate to their wedding day. Many have had a dream setting in mind since their engagement. Some of the most popular destinations are the beaches of the Caribbean; Hawaii; and Mexico, while others prefer historic settings or national parks. Extreme activity and sports-themed weddings are also considered destination weddings, and couples can take their vows while skydiving or scuba diving, or the ceremony can take place at a very non-traditional venue like a NASCAR race. For those who want to travel to Europe, consider England, which boasts the shortest flight to Europe and romantic settings like manor houses or castles, or Italy which is known for scenic villa and winery weddings. Couples with a more limited budget may enjoy destinations like Las Vegas or Florida, which are popular for all-inclusive weddings. A higher budget will afford an exotic wedding in Fiji or Australia. Travel dates and trip length are major factors in choosing a location. Will you and your guests fly, drive or take a train? Traveling out of the country will require more time as well as passports or other documentation for couples and guests. Some will choose to have their wedding at a closer location, and then splurge on a dream honeymoon once guests head back home. Before you are set on anything, though, check with your travel professional, as some hotel or resort packages include a free honeymoon if the couple commits to a certain number of rooms or guests for the wedding. The couple planning a destination wedding must also take weather and season into consideration. 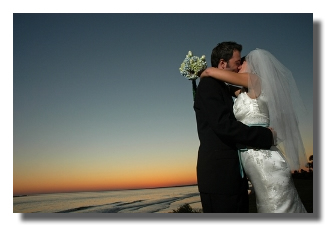 Beach weddings can be spectacular, but weather conditions change quickly and can be uncertain. Couples wishing to marry in the Caribbean have hurricane season to consider and may opt for an island like Aruba, which is out of the hurricane belt during the fall months. Finally, planning your ceremony during a destination's peak travel season can mean crowded resorts and perhaps a less intimate backdrop for the ceremony. Given your special itinerary, your travel consultant can make recommendations or help you narrow down your destination wish-list. 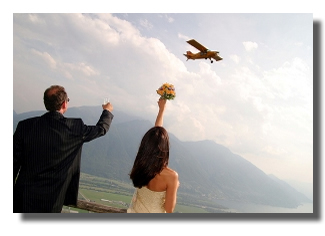 Destination weddings can range from amazingly inexpensive, and far less than a traditional wedding, to very costly. Once you have an idea of where you would like to be married, analyze your budget. Carefully assess the costs of travel, accommodations, activities and meals. Decide how many guests you can truly afford at the wedding and whether or not you will pay for any part of their travel. If you are hoping for a crowd of guests and/or expect them to pay for any expenses, planning early and sending travel information well in advance is a must. If cost is an important factor, your travel agent can offer a variety of options in any destination. It is possible and often very desirable to take a minimalist, stress-free approach to your destination wedding. In many instances, all you'll need are a justice of the peace or similar official, a wedding license, and a romantic spot. Don't let price be the ultimate determinant of your dream ceremony. Be creative. At home or in an exotic locale, the guest list can pose problems. Many couples choose to elope and skip invitations. They simply send an announcement when they return home and maybe throw a fun party so everyone can still get together and celebrate. Other couples find that destination weddings give them the option to invite only a few close friends or family members, so they are forced to reduce their guest list a very manageable number of special invitees. And still others will send invitations out to a larger number, placing the decision solely in guests' hands (and perhaps their wallets) to attend the wedding. Keep in mind that some resorts only allow guests over age 16 or 18, so an adult-only location may not work for guests with families. Who can you expect to attend a faraway wedding? Sometimes the RSVP's are quite surprising. Many who are invited actually attend in order to combine their own vacation with the couple's special day. Most hotels will offer special room rates to couples and their guests or a certain number of rooms may be part of the wedding package itself. Conversely, some may not have the financial means or the ability to take off work to travel. Give some forethought to how long guests will stay at the wedding site. Couples can travel alone and have guests arrive a day or two later, or everyone can travel together as a group. If guests arrive a few days before the wedding, fun options are arranging a group tour or sightseeing in smaller groups if you have a lot of people or guests with different interests . You may also plan nothing at all, and allow guests some quiet vacation time of their own before the wedding; in this case, consider sending along a destination guide (often available free from your travel agent) so they can choose their own itinerary. As you might imagine, the legal requirements for destination weddings can vary greatly . Most popular destination wedding locations in the United States and abroad have streamlined the process and provide very solid information on their consular or official tourism web sites. Some destinations require a residency period before you can be married. In places like France and Fiji, couples may have to spend up to 40 days in residency before the wedding, which can make things very difficult and much more expensive. Other locales only require a waiting period of 3 days or less and are far more manageable. Your travel consultant will assist you with these details and again - this is where having an expert help really counts! There are no end of stories of brides who end up with a great honeymoon, and a civil ceremony that follows at home because they were not prepared. Couples will need documentation before they travel, and often a few months before the event itself. Required documents may include birth certificates, passports, previous marriage certificates or divorce decrees if applicable. Your local contacts will provide information on requirements for blood tests or applications for licenses. American diplomatic and consular officers are not permitted to perform marriages. Marriages abroad are almost always performed by local civil or religious officials. In general, marriages that are legally performed and valid abroad are also legally valid in the United States, but in any event, inquiries regarding the validity of a marriage abroad should be directed to the attorney general of the state in the United States where the bride and groom live. Minimum marriage age varies from one country to another. Persons under the age of 18 must, as a general rule, present a written statement of consent executed by their parents before a notary public. Some countries require the parental consent statement to be authenticated by a consular official of that foreign country in the United States. In short, don't underestimate the rules and regulations you'll need to address, sometimes far in advance. And you always have the option of marrying at home before or after a non-binding ceremony at your destination - you may find this to be the best choice to ensure that you'll enjoy every minute of the trip. Once you choose a destination and have a good idea what it will cost and who you are going to invite, you can start planning the ceremony details. Wedding coordinators can make a lot of the arrangements, and many resorts and cruise lines even have their own wedding departments. If an on-site wedding planner is not available, think about hiring your own planner to help with details, research and correspondence. Destination wedding planners will often offer traditional choices for flowers, food and music to fit a wide variety of budgets. Wedding details that may have taken months to plan for a hometown wedding can often be chosen in just a matter of minutes at the destination itself. If you are on a budget, remember that many hotels, beaches, outdoor settings and the like are inherently decorated or beautiful in their own right - this is one step you may be able to skip. Regardless of your location, however, many of the decisions remain the same. Do you want a rehearsal dinner the night before? Do you want a formal reception or just a table for two at a romantic restaurant? Do you want to wake that morning and leisurely get dressed and married or do you want to enjoy a spa treatment or massage? Music can be planned in advance or chosen on site, or some couples may choose no music at all and rely on things like waterfalls or ocean waves as the backdrop. Food can be catered and include ethnic or theme-oriented foods applicable to the locale or setting. Like any wedding, attire can be formal and fancy or simple and casual. Clothing can reflect local culture and tradition, or you may prefer to still "walk down the aisle" in a more elegant wedding gown. If flying, formal wear like a wedding gown or tuxedo should be packed as a carry-on, if possible. If it is very important to arrive with particular items of clothing or other accessories, carry them onto the plane and avoid the heartbreak of a lost gown - or plan the wedding with time to allow for delivery of lost luggage, just in case. To avoid traveling with wedding wear, clothing can be shipped separately and in advance (this may result in a small storage fee at the hotel), or attire can sometimes be rented at the hotel or resort. Photography, video and flower choices are abundant and often quite similar to traditional wedding choices. 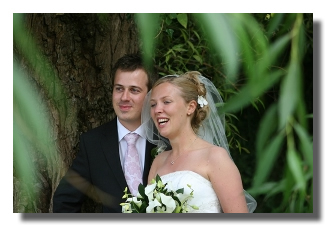 Couples can choose to hire a photographer, or they can simply rely on guests to capture more impromptu photos. 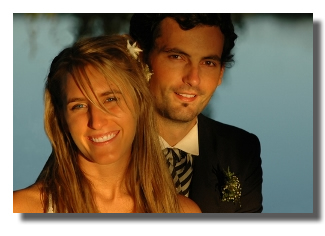 Many all-inclusive wedding plans also include a photography package and video. Some videos will even include local footage of the area, like dolphins swimming or a video introduction of the resort or island. Flower arrangements are usually provided by a local florist and can often be chosen before you arrive or on site from photos and catalogs. Couples can also choose from popular pre-written wedding vows or write their own. Be sure to inquire whether you need to supply your own witnesses for the ceremony, or whether the resort can provide them for you. Also remember that many wedding packages do not include gratuities for services provided by ministers, bartenders or transportation companies, so budget accordingly. As you finalize arrangements, remember that some of the same tips that apply to traditional weddings also apply to destination weddings: avoid over-planning and allow ample free time for you and your guests to enjoy the wedding. Group activities can be a fun way to spend time with everyone, but don't overwhelm yourselves or guests with a rigid schedule or a strenuous activity the day before the wedding. Most importantly, remember that this is your day. Plan your dream wedding and make it your own. That's what destination weddings are all about.